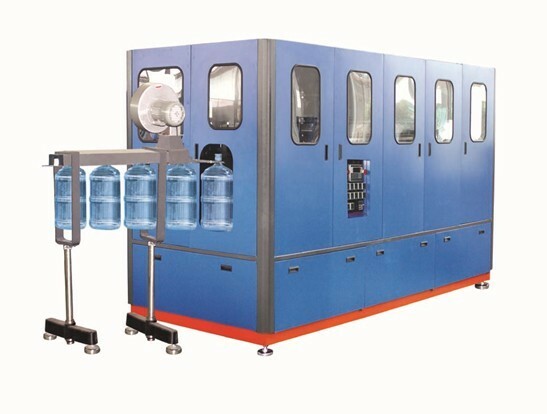 BM-120A Fully-automatic jar bottle blow molding machine can automatic produce 3 gallon to 5 gallon bottles.It can comes with the BOTTLE CONVEYOR, which can be connected with the filling, capping and washing machine. 1. the CM-120A ‘s desgined with FULLY AUTOMATIC, means the preform is loaded AUTOMATIC. 2. the machine comes with the BOTTLE CONVEYOR, which can be connected with the filling, capping and washing machine. 3.power consumption is ONLY 25KW. 50% less than the traditional machine. after using 2 years, the saving on the electirity is the same valve as the machine’s cost. 5. The machine’s DESIGN is very simply, simply means durable and reay to repare. is to cooling the mold from the high tempeature, there by increase the opeation speed and extend the mold’s life time. because during the operation, the mold’s tempeature will go up, we need to use the water or fan type of chiller to cooling down the mold. customer can use the normal tape water to subsituate, but the fan type of chiller has better effort. it is the aior cource for the PET stretch blowing molding machine, it carriying out the process of compressoing air from atmosphere to the required pressure, in order to blow up the preform into request bottle shape. is supply the air for the cylinder’s closing, clamping and machine’s movement. is to clear up the impurities out of the compressed air, like carbon-hydrogen, tiny durst and solid particles. is to purify , remove and moisture from the compressed air and lower tempearature of the compressed air in the heat exchanger. is to receive and supply air for the machine as storage. Only requested by the full automatic, 2 or more than 2 cavity blow molding machine, because these machine consumption more air, evertime compressor produce the air need times, thereby, need the air receiving tank to storage the air.